By: Michael P. Pappas, Michael P. Pappas Law Firm, P.C. 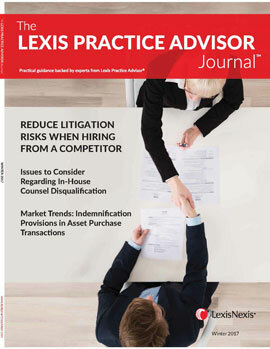 This article discusses ways to reduce the risk of litigation when hiring someone away from a competitor. Litigation involving trade secrets, non-compete agreements, and other postemployment restrictive covenants has grown exponentially, roughly doubling every decade since 1980. Often, these lawsuits are directed not only at the departing employee, but also at the employee’s new employer. Many unsuspecting employers have found themselves roped into costly and time-consuming litigation after hiring a competitor’s former employee. If an organization frequently hires from competitors, it should familiarize itself with general hiring customs in the industry, including how aggressively (if at all) employers seek to enforce post-employment restrictive covenants. In many industries, there is a general understanding that employees jump from employer to employer, or that employees take their personal clients with them when changing employers. In those industries (e.g., advertising, retail), enforcement of restrictive covenants is not a high priority, and litigation is relatively rare. Conversely, in hyper-competitive industries where information and clients are jealously guarded (e.g., technology, insurance), the risk of becoming embroiled in restrictive covenant litigation is significantly higher. In other fields, such as the financial sector, competitors have joined together to reduce costly litigation by establishing written protocols governing the recruitment and hiring of each other’s employees. See Protocol for Broker Recruiting. An understanding of restrictive covenant litigation practices in a particular industry can help an employer better evaluate the potential risks of hiring someone from one of its competitors. Understanding these facts is critical to evaluating how the competitor will react in the face of losing the employee to a rival employer. In addition, in the event the candidate is subject to potentially valid restrictive covenants, a thorough understanding of the candidate’s old and new roles can help the hiring employer structure the candidate’s position and create institutional protocols that provide assurances against breach of those covenants. There are a number of resources from which an employer can obtain relevant information about the candidate and his or her role at the competitor. Although it is helpful to obtain such information directly from the candidate, employers should not rely solely on a candidate’s representations, which might be self-serving or inaccurate. Rather, employers should attempt to independently verify information from the many public sources now available, including public-facing networking websites such as LinkedIn, industry directories, and the competitor’s own public-facing website. Many states prohibit requiring applicants to provide social media passwords or accept connection requests. As of November 7, 2016, 24 states have enacted social media privacy laws, namely, Arkansas, California, Colorado, Connecticut, Delaware, Illinois, Louisiana, Maine, Maryland, Michigan, Montana, Nebraska, Nevada, New Hampshire, New Jersey, New Mexico, Oklahoma, Oregon, Rhode Island, Tennessee, Utah, Virginia, Washington, and Wisconsin. Thus, employers should comply with relevant state laws when considering whether to rely on social media information that the general public cannot see or that is protected by passwords or other privacy measures. In addition, the hiring employer may want to obtain relevant information about the candidate’s former employer. For example, with the advent of electronic court filing and docket search software, employers now have the ability to research whether and how frequently the candidate’s former employer has pursued litigation against departing employees for violating non-compete agreements or other restrictive covenants. Many times, employers interviewing candidates from a competitor might inadvertently (or sometimes purposefully) elicit confidential information about the competitor’s business, including, for example, customer identities, the competitor’s future plans and strategies, and/or profit margins. Because the candidate’s disclosure of such information might violate an existing confidentiality agreement (or common law confidentiality principles), employers should train interviewers to avoid questions that might prompt improper disclosures and to quickly stop candidates who begin to volunteer trade secrets or confidential information. Interviewers should state at the outset that the candidate should not disclose the competitor’s trade secrets or confidential information at any time. Further, interviewers should tell candidates not to specifically identify clients when discussing their accomplishments, responsibilities, and work projects. You should advise employers to instruct interviewers never to ask the interviewee about the competitor’s nonpublic customer or business information. Even if the candidate initiates the conversation about these issues, the interviewer should cut off the discussion immediately. Finally, advise the employer to instruct interviewers not to use a job interview as a vehicle for gathering intelligence about a competitor. The hiring employer cannot fully appreciate and avoid the risk of restrictive covenant litigation without having full knowledge of a candidate’s potential legal obligations to his or her former employer. Therefore, you must insist that the candidate provide full disclosure and copies of any employment contracts, stock or incentive compensation agreements, policies, or other documents that contain potential restrictions on post-employment activities. Furthermore, you should emphasize to the candidate that a failure to disclose will result in serious adverse consequences, such as termination of employment if he or she is hired, and/or the hiring employer’s refusal to assist the candidate in defending claims based on undisclosed covenants. Only with full disclosure of existing restrictive covenants can the hiring employer properly evaluate the scope and breadth of the covenants, what the potential risks of litigation will be, whether the hiring is worth the risk, and the likelihood of prevailing in the event of litigation. In evaluating a candidate’s obligations to his or her former employer, it is important to have up-to-date knowledge of the most recent legal developments concerning the enforcement of restrictive covenants under both federal and state law. The landscape of restrictive covenant law is perpetually in flux, with many jurisdictions now considering measures to prohibit or significantly restrict the use of non-compete agreements. For example, the attorneys general of New York and Illinois have taken aggressive action to prohibit the use of non-compete agreements against lower-level employees and are continuing to investigate employers who use non-compete agreements and other restrictions without a clearlydemonstrated business need. In addition, on August 19, 2016, Illinois enacted the Freedom to Work Act (effective January 1, 2017), 2015 Bill Text IL S.B. 3163 (820 Ill. Comp. Stat. 90/1 et seq. ), which bans enforcement of non-compete agreements against low-wage employees. For more information on this Illinois non-compete statute, see Navigating Restrictive Covenants in Illinois. Although the long-term effects of this law and the government investigations remain to be seen, there is a clear trend toward limiting both the use and scope of covenants not to compete. For detailed information on a particular state’s restrictive covenant requirements, which will help you evaluate candidates’ restrictive covenants, see the relevant state’s “Navigating Restrictive Covenants” practice note on Chart – State Practice Notes (Non-competes and Trade Secret Protection). It is important to obtain written representations from candidates concerning potential restrictive covenants. Below are examples of key written statements the hiring employer should obtain concerning restrictive covenants and confidential information. I warrant that I am not a party to any employment, consultancy, or independent contractor agreements with [Former employer] or any other prior employer, and am not subject to any post-employment restrictions that would prohibit or limit my employment by [Hiring employer]. This type of warranty can reduce the risk of being sued by the candidate’s former employer by demonstrating that the hiring employer hired him or her in good faith and without any knowledge of the restrictive covenants. Or, in the event of litigation, this type of warranty can provide a defense to tortious-interference claims by establishing lack of knowledge of the candidate’s existing contract with the competitor. Information on tortious interference claims and other potential claims by a competitor is discussed later in this article. I will not disclose to [hiring employer] (the Company) or induce the Company to use any confidential or proprietary information belonging to [former employer] or any of my prior employers. Further, I represent and warrant to the Company that the performance of my job duties for the Company shall not violate, cause the breach of, or conflict with any prior agreement, contract, or understanding between me and any third party or otherwise violate any confidence of another. I warrant that I have not taken or retained, and am not in possession of, any business materials or documents belonging to [former employer]. I acknowledge that the Company has advised me that I am strictly prohibited from bringing such materials or documents onto the Company’s premises, providing such materials or documents to Company personnel, or using them in connection with my employment with the Company. First, it emphasizes to the candidate that the hiring employer does not expect, and will not tolerate, the use or disclosure of a competitor’s confidential information. This makes it less likely that the candidate will attempt to exploit such information for the hiring employer’s benefit, thereby reducing the risk that the candidate will violate any confidentiality agreements or common law obligations. Second, it can help the hiring employer demonstrate that it was acting in good faith and is not responsible for the employee’s violation, which was in contravention of his or her written representations and the hiring employer’s instructions. If the candidate is subject to potentially valid restrictive covenants, but is being hired in a capacity that does not implicate those covenants, the hiring employer should specify in writing—whether in an offer letter, employment contract, or other hiring document—the exact nature and scope of the candidate’s new position. This should be done in a manner demonstrating that his or her employment does not conflict with any existing post-employment restrictions. For example, if a restrictive covenant applies only to a certain geographic area, business segment, or client base, the hiring employer should specify up front, in writing, that the candidate’s responsibilities will be in a different geographic area or business segment, that he or she will be servicing only certain kinds of clients or prospective clients, or that he or she is otherwise being employed in a noncompetitive capacity. There might be a period in the hiring process when the candidate has accepted a job with the hiring employer but is still working at the soon-to-be former employer. The hiring employer should address the following issues with the new hire in this situation. In many cases, restrictive covenants contain a provision expressly requiring the departing employee to return any confidential information and other employer property in his or her possession, either before leaving or within a finite period following his or her departure. The hiring employer should instruct new hires (preferably in writing) to comply with any property-return provisions to ensure that the new hire does not possess any of the former employer’s confidential or proprietary materials when he or she starts with the hiring employer. In fact, the hiring employer should take this precautionary step even in the absence of an express return-ofproperty provision. Assigning the candidate to a non-competitive segment of the company until the restrictive covenant expires candidate’s former employer will not sue. However, they reduce the risk that a candidate will breach existing restrictive covenants and provide a compelling defense if litigation does occur. The hiring employer took diligent steps to determine at the pre-hire stage whether the employee was subject to postemployment restrictions. The hiring employer had no knowledge or forewarning that, by hiring the employee, it was interfering with an existing contractual restriction. The hiring employer instructed the new hire that he or she was not expected or permitted to (1) use or disclose any trade secrets or confidential information belonging to his or her former employer, or (2) improperly divert business opportunities belonging to the former employer. The hiring employer instituted internal protocols (such as ethical walls) to ensure against the inadvertent use or disclosure of the former employer’s trade secrets or confidential information. Frequently, a hiring employer can defuse potential restrictivecovenant litigation before a lawsuit is ever filed by effectively responding to a cease and desist letter from the former employer. In many cases, the former employer will provide the new hire and the hiring employer with an opportunity to voluntarily comply with the employee’s post-employment restrictions by (1) informing the hiring employer of the existence of the restrictions and (2) demanding assurance that the restrictions will be observed. A cease and desist letter might sometimes also demand that the hiring employer take some affirmative action, such as withdrawing the employment offer or discharging the employee if it has already hired him or her. The former employer has no intent to litigate, but uses the threat of litigation to force the employee and hiring employer to refrain from or moderate any violative conduct. The former employer will litigate if forced to, but prefers to obtain assurances of compliance and resolve the matter without litigation. The former employer fully intends to litigate, and sends the letter to create a record for later use in court. Whatever the former employer’s motive, it is advisable for the hiring employer to respond to a cease and desist letter promptly. Ignoring the letter completely is unwise. There are a number of strategies for responding to a cease and desist letter, depending on the facts and circumstances of a particular case. If the letter identifies post-employment restrictions that the new hire failed to disclose, the hiring employer should consider whether the new hire made intentional misrepresentations. If so, the hiring employer might respond to the letter by informing the former employer that it will not continue to employ the employee. There might be instances where the cease and desist letter provides detailed facts and examples of improper conduct by the new hire of which the hiring employer was not aware, such as evidence of mass misappropriation of confidential documents and data immediately prior to the employee’s departure. If that is the case, the hiring employer should issue a prompt response stating that it will immediately investigate the matter and take appropriate action if the former employer’s allegations are corroborated. If the hiring employer does not discover any corroborating evidence, it should so notify the former employer. If the former employer’s allegations turn out to be true, the hiring employer will need to decide what action to take with respect to the new hire, and should advise the former employer what ameliorative actions it has taken. To reduce the risk of restrictive covenant litigation, it is not enough for the hiring employer to obtain written representations and implement institutional protections at the outset of employment. You should advise the hiring employer to continue to monitor the employee’s compliance and remind the employee of his or her obligations during the entire period the restrictive covenants are in place. Also, encourage the hiring employer to periodically review whether all protocols are being observed, including the employee’s use of confidential information and involvement in areas from which he or she has been excluded. In cases where particularly sensitive and valuable types of competitive information are involved (such as secret formulas, source codes, patents, and the like), advise the hiring employer to consider periodically auditing the employee’s communications and work product to ensure that it is not exposed to claims that the competitor’s trade secrets are being stolen. In many cases, the hiring employer might be able to avoid, or extricate itself from, restrictive covenant litigation by terminating the newly hired employee. However, immediate termination is not always possible due to contractual restrictions, particularly in the case of high level executives. Therefore, the hiring employer should ensure that it is able to terminate the offending employee without penalty in the event he or she engages in wrongdoing and violates restrictive covenants with a former employer despite the hiring employer’s best efforts. This can be accomplished, for example, through employment contract provisions permitting immediate termination for cause if the employer determines that the employee either (1) misrepresented his or her existing obligations to the competitor at the time of hire, or (2) engaged in conduct exposing the employer to liability by violating his or her post-employment obligations. These kinds of protections can help the hiring employer avoid the unenviable choice of having to defend a restrictive covenant lawsuit by a competitor or a wrongful termination lawsuit by an employee. Michael P. Pappas is the principal and founder of the Michael P. Pappas Law Firm, P.C., specializing in employment litigation, counseling, compliance, and administrative charge response. Prior to starting his own firm, Mr. Pappas practiced at the nation’s leading employment law firms for more than 25 years. He is also the President and C.E.O. of Employment Compliance Advisors, LLC, a legal consulting firm.